Weather: Low 70's, mid 60's at start. Night race. 9 9:08 Sort of out of gas here. The Utah Midnight Half Marathon is a bit of a summer tradition for me. 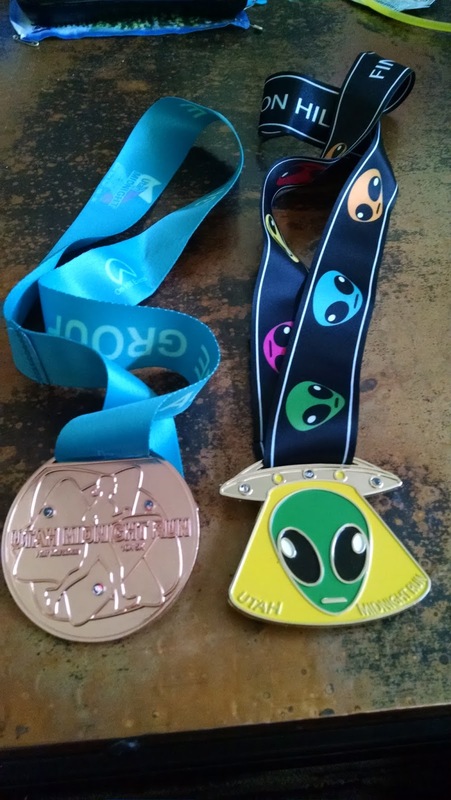 I started doing its sister race when I first moved to Utah in 2012 (The Legacy Midnight Run) and I jumped on board the Provo race in 2014. The race is located in Provo, home of BYU and is about 30 minutes from my house. It is a "midnight" run that starts at 10 PM. There is a 10K and 5K as well, which each race to more or less designed to have you finish around midnight. 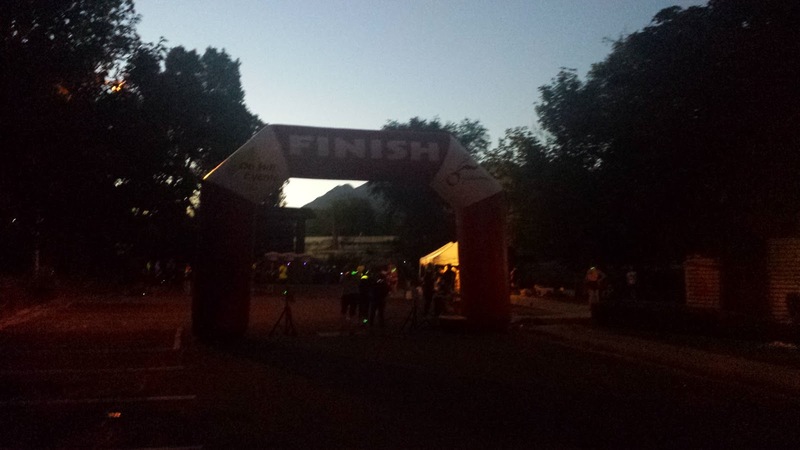 Due to some high water issues, this year's race started near the Days Inn hotel in Provo. In years past, it was located near the Baymont Hotel. It was also pointed out that there was a bit of a water hazard on the race -- at about the 2.5 mile marker, the Provo River had flooded an underpass and would require runners to go about 50 (or so) yards in 6 to 9 inches of water. So things were definitely a change from years in the past. First off, I had a hard time finding the race. The pre-race emails, at least to me, were a bit confusing. I initially arrived about an hour early to the old starting line -- only to find no one there. So I immediately pulled up the email and punched the address to the one in the email. I arrived there and drove around a parking lot and didn't really see anyone who looked like they were getting ready for a race. I immediately broke into a cold sweat. Darn, where was this thing. I don't know Provo real well but I drove around and didn't see anything that looked remotely like a race starting. I finally decided to go double check the place where I stopped at and drove way into the back of the complex -- and saw what looked like runners getting ready for the race. Yeah! I quickly signed in, grabbed my shirt and had about 30 minutes to kill before the race start. I didn't have too many goals on this race other than to see what I had. I hadn't run much all week thanks to last weekend's half marathon. I had felt sore and beat up most of the week and just flat out burned out. On the plus side, when I did arrive to the starting line, I was feeling pretty good. The race started at 10 PM. I wanted to start out conservatively, but the first part of the race is a slow down hill. I was tailing the 1:50 pacer and wound up holding within shouting distance of him for most of the first half of the race. For a while I was running with a group of 2 women and 1 young man but after about a mile and a half I turned on the jets a bit. At mile 2.5 or so, we finally reached the 'water crossing'. The race director had warned us this was coming up and I wound up splashing through it. The water was chilling but actually not too awful. For the next half mile though, I was sloshing around in my shoes though. It was sort of funny, on the way back seeing people from the 10K taking off their shoes to wade through. Come on -- it's race. Power through it! It was pretty lonely running for the first half of the race. I could feel someone breathing down my back every now and then. His (or her) light was bobbing and helping illuminate my way. Occasionally they would catch up but I just held steady. The 1:50 pacer was making ground on me and I was using his beacon to figure out where to go, but soon he was a distant memory. The race is usually held on a full moon but for whatever reason there wasn't much moonlight. I wound up using my headlamp (which I carried) for most of the race. Water stops were at the 1.55, 3.10, 4.55 and 5.25 spots. I had a hard time judging my pace. I was so focused on not tripping over any of the little ridges from tree roots on the trail. Occasionally, I'd glance at the mile splits when my Garmin signaled a new mile. I knew the course, which was good. I was running solo almost the entire race and I think if it had been my first time, I would've been really uneasy. It was just so dark and I kept having visions of some lunatic jumping out of the woods to mug me. I did know where I was at all times and more or less you follow the Provo River until you get to Utah Lake. The race director had warned us that the course was a little short (and had offered to make us run a bit of extra distance to make up for it) but this year it appeared to be WAY off. The turn around came at mile 6.20 or so. My total mileage, according to my Garmin, was 12.22. I sort of checked in with a few other runners and they too came up short. I think with the new start location (that resulted from a trail condition) that the course wasn't quite a half marathon. After the turn around however, I was pretty gassed. I was happy to see I was in roughly 6th or 7th place overall. I was getting a lot of encouragement from folks on the way back in who hadn't reached the turn around point. I did, however, at mile 7 have to use the restroom. I thought about just toughing through it, but this was a critical situation. I'll just say, I almost messed my shorts and luckily there was a bathroom just in the nick of time. It probably cost me a minute and I think two or three people passed me as a result, but a more dire situation would've resulted if I hadn't taken care of business. The last half of the race was tough. I knew I was grinding out the miles and my legs just felt fatigued. Looking at my splits and stride rate, I could tell where I was getting tired. On the flip side though, I lasted a bit longer than I usually do. I think it was nice to run at night with ideal weather conditions. I was also getting a LOT of encouragement passing / working off of the 10K and 5K racers who were running a shorter edition of the course, who had started at 11 PM and 11:30 PM respectively. I always think I am going to do well at this race. But it is hard to run fast on this one. The footing is a little off and it is hard to judge your pace. For whatever reason, I felt like I was running faster than what I was. I carried my own hydration, which I went through about 50% of it. The water stations were well manned and at appropriate spots. I think they could've used a bit better markings on the course -- at least to let people know you are going the right way. It was so dark and a little off-putting, especially to someone unfamiliar with the area. This was my 4th time running the course, so I certainly remembered most of it. The shirt I got was a repeat of last years. Kind of a bummer because On Hill Events shirts are usually pretty cool. I wound up swapping it out for a smaller size, which I'll give to a friend. The medals -- both finishers and my master's age group award -- were outstanding. They were nicely designed, heavy-duty and have blinking lights. I jumped in early on this race. I think I got a special for like $50 or something this winter. For the experience received, it was a good deal. With halves costing over $70 in some cases, this was good. Post race food was plentiful. These night runs are like a party. Plenty of Fat Boy ice cream sandwiches, which I love, cotton candy, Powerade, and fruit. I wasn't in an eating mood, but the ice cream was a winner. I wound up socializing until the age group awards were presented (it took awhile since I had to wait through the 5K / 10K awards). I was freezing but I had come prepared and had a sweatshirt and jacket in my car, which kept me toasty. It wasn't until just after 1 AM (about an hour after finishing) that I was able to hit the road. I didn't hit the sheets until after 2 AM. Definitely a long night. My performance on this race was so-so. If I extract out the results, I ran roughly a 1:56 half marathon. I also extracted out the results to the other original course and I came in a few minutes slower than years past. Not totally unexpected, but I would've hoped for better. As usual, the latter half of the race was tough and I really didn't have anyone to work off of. I was running solo for nearly 80% of the race. But looking at the Garmin pull, a lot of it wasn't too bad.